Cleo has been with us for 3 weeks today. 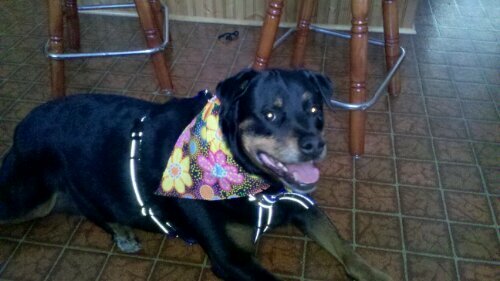 She is a 10 year old Rottweiller. She seems to be settling into our household quite nicely. We finally got her to the vet this past Wednesday, a huge operation getting her in and out of the SUV….with her old bad hips. She has gotten the first round of shots and nail clipping done by the vet. We went on the search for glucosamine products, paid way too much at the local pet store, and managed to order online via Amazon a 4 month supply for 1/3 the local price. Because we live on the edge of the woods, ticks are a big concern. We learned that there is a shot the dogs can get to prevent LYME disease. It is accompanied by the usual flea & tick topical medications. Thinking that anything you do to prevent a problem is the way to go. On Thursday, the mobile groomer came with her camper / dog grooming vehicle. Cleo had a 2 hour spa treatment, and came out smelling like a brand new baby! (She felt wirey before, now she feels like silk!) The scarf is courtesy of the groomer! What a difference a bath makes in the life of a dog. For one thing, it makes the whole house smell a little better, and no more black smudges on my fingers (and rugs) from her dirty old coat. She seemed like she enjoyed the process, and I know I will have to be a regular customer of the Park & Bark grommer! So, that is our life, pet free zone until 8 months ago…now with a family of 3 cats and a rottweiller…..somebody knows what a sucker I am for animals……keeps me entertained!